I didn’t count on quite how intricate the underlying science is (it became ever clearer to me why there is so much confusion in this area), so the process took some considerable time, but I believe that this post is now something that many will find useful. It has been checked for accuracy by qualified experts. In order to fully understand the relationship between greenhouse gas emissions and global temperature increase then, we first need to consider the concept of radiative forcing. 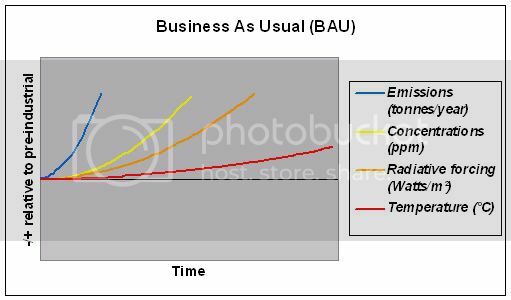 If the planet were losing energy at the same rate it was gaining it then the radiative forcing would be zero and the temperature would remain stable at its current level – this state is called thermal equilibrium. Since a hotter planet loses more energy into space, the natural system tends to move towards thermal equilibrium. Global warming potential (GWP) is an estimate of how much a given greenhouse gas contributes to Earth’s radiative forcing. Carbon dioxide (CO2) has a GWP of 1, by definition, so a gas with a GWP of 50 would increase radiative forcing by 50 times as much as the same amount (mass) of CO2. A GWP value is defined over a specific time interval, so the length of this time interval must be stated to make the value meaningful (most researchers and regulators use 100 years). 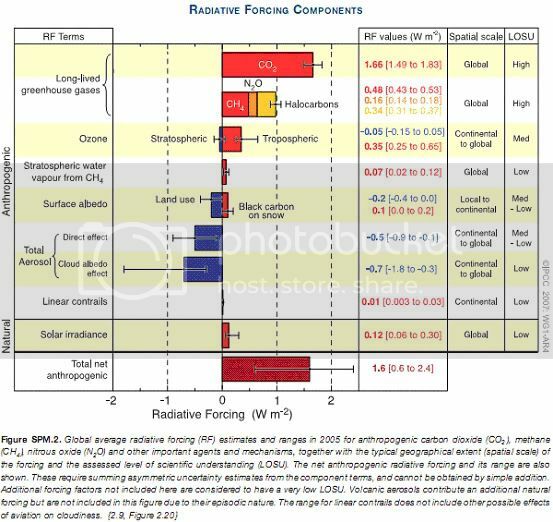 Radiative forcing is the fundamental issue, but it is easy to see why most discussions revolve only around emissions – not only are CO2 emissions much the largest way in which humanity is changing the planet’s radiative forcing, but they are also easier to understand conceptually and easier to quantify than radiative forcing. Emissions are still increasing year-on-year (faster than projected in any of the IPCC’s scenarios) and atmospheric CO2 concentrations are currently rising by between 1.5 and 3 ppm each year. They are at roughly 385ppm in mid-2008 (for the very latest updated CO2 figure click here). Ok, that’s it! If you followed everything here you should be well-equipped to consider the scientific discussion of climate change. Indeed, you may find you understand it better than some of those who write and speak about it! Hopefully this post will provide a resource to aid wider understanding of the changes we are causing to our global climate system and the climate emergency we are facing. Should any inaccuracies come to light I will of course amend them. This work forms part of my forthcoming book The Transition Timeline, produced in partnership with the Transition Network, and set for publication in March 2009 and available now, published by Green Books. It uses the understanding outlined here to examine the wider context of climate change and peak oil, discuss the options facing our communities and consider the cultural stories which underlie our choices. 1. There is also a warming effect from the geothermal energy at the Earth’s core, but this is sufficiently small and stable that for our purposes we can ignore it. 2. Parts per million is the ratio of the number of greenhouse gas molecules to the total number of molecules of dry air. For example, 300ppm means 300 molecules of a greenhouse gas per million molecules of dry air. Strictly speaking concentrations are measured in parts per million by volume (ppmv), but this is widely abbreviated to ppm. Don’t be confused if some papers refer to ppmv. 3. Emissions are not the sole determinant of atmospheric greenhouse gas concentrations due to the Earth’s natural ‘carbon sinks’ which soak up some of our emissions. Concentrations are not the sole determinants of radiative forcing due to other forcings which will be discussed shortly. The time delay between radiative forcing and temperature increase is caused by the thermal inertia of the planet – it has great mass (with much of the heat initially being used to warm the deep oceans) and therefore takes some time to warm or cool. Of the (equilibrium) temperature increase ultimately produced by a given increase in radiative forcing, only about half manifests within 25 years, the next quarter takes 150 years to manifest, and the last quarter many centuries. 5. Figures from: IPCC AR4 Working Group I Report, Chapter 2 , Table 2.14, p. 212. More detail on GWP available at: http://en.wikipedia.org/wiki/Global_warming_potential – note that the GWP for a mixture of gases cannot be determined from the GWP of the constituent gases by any form of simple linear addition. 6. There is also a separate but related concept called Carbon Dioxide equivalent. This gives the amount of CO2 that would have the same GWP as a given amount of a given gas (or mixture of gases). It is simply calculated by multiplying the GWP of the gas by the given amount (mass) of gas. For example, over a 100 year period methane has a GWP of 25, so 1 gram of methane has a Carbon Dioxide equivalent value of 25 grams. In practice, since Carbon Dioxide equivalent is expressed as a mass (grams, tonnes etc. ), and Equivalent Carbon Dioxide (CO2e) is expressed as a concentration (usually in parts per million), they are not easily confused, despite the similar names. You may also encounter references to the “carbon equivalent”, especially when discussing carbon that is not in gaseous form (e.g. carbon in coal deposits). A carbon equivalent figure can be converted to carbon dioxide equivalent by multiplying by 3.644 to account for the different molecular weights (3.644 tonnes of CO2 contains 1 tonne of carbon). 7. The IPCC is the Intergovernmental Panel on Climate Change – the body established jointly by the United Nations and the World Meteorological Organisation in 1988 to assess the available scientific evidence. 8. The IPCC considered the so-called ‘Kyoto basket’ of greenhouse gases (GHGs). Under the Kyoto Protocol, signatories committed to control emissions of a ‘basket’ of six GHGs – carbon dioxide, methane, nitrous oxide, HFCs, PFCs and SF6. 15. See footnote  above for details on climate time-lags. Figure for warming from emissions to date taken from the Climate Code Red report by Carbon Equity, p.22. Also see IPCC AR4 Working Group III Report, Summary for Policymakers, Table SPM.5, p.15 for ultimate (equilibrium) warming from current atmospheric concentrations. Finally, note that a 2008 paper in the Proceedings of the National Academy of Sciences examined the impacts of air pollution (which blocks sunlight and thus reduces temperatures – the effect known as ‘global dimming’) and found that this is masking the full extent of the warming effect from greenhouse gas concentrations. Building on the IPCC’s work, the paper finds that if air pollution reduces – as it is expected to do – then 2005 atmospheric concentrations could commit us to around 2.4 degrees of warming above pre-industrial temperatures, with about 90% of this warming taking place this century. 3. Indicative climate graph created by author in partnership with David Wasdell, and with assistance gratefully acknowledged from Ben Brangwyn. 4. Indicative climate graph created by author in partnership with David Wasdell, and with assistance gratefully acknowledged from Ben Brangwyn. 6. Indicative climate graph created by author in partnership with David Wasdell, and with assistance gratefully acknowledged from Ben Brangwyn. An impressive bit of sorting out, but I am guessing that it is still far too complex for most people to sort out the message coming from science … which is potentially disastrous since it perhaps will require the people to insist on government action before we get any. I note also that CO2 concentrations are not just increasing but accelerating upward in uncontrolled manner . 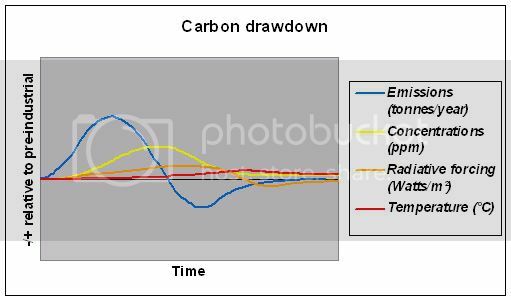 The lowest graph above indicates that to bring CO2 down again under control that we simply must bring CO2 emissions below pre-industrial levels , something with absolutely massive implications for our way of thinking , our work, and our lifestyle, changes which are being currently almost completely ignored by our governments. So how few years do we have to act to prevent eventual disaster of 2 degree C temperature rise and what is involved if we do change our ways and act to save ourselves? Is it even possible in any realistic plan for the whole world to change so much in those few years when in fact we are still going the wrong way by increasing CO2 output, not reducing it ? What then are the real targets we need to guarantee reaching and time frame involved to stop catastrophic human deaths beyond say ten times the current unacceptable levels ? … since it would seem that we will not treat the matter as urgent and initiate emergency changes until we know in a format many can understand, that is before the results are felt painfully by most and have become irreversible . The problem it seems is that we have walked blindly into a trap , since global warming continues long after we act to slow it… but we are still looking at the comfort of our lifestyle now rather than the misery and death we are buying for our future by inaction, the real inevitable consequences of inaction are not being seen by most, nor the rate of response required for acceptable mitigation of human loss of life. One study (below) indicates that we are already committed to a further 0.5 degrees C rise even if we were to control emissions to year 2000 levels , which we are not doing … is the implication then that we are already committed, by inaction, political inertia, to future catastrophic damage to our home planet’s ability to support human life… the death count simply determined (exponentially with time , up to human extinction) by our level of inaction in the next few years. Why would an intelligent species not minimise the long-term risk of catastrophe to itself ? 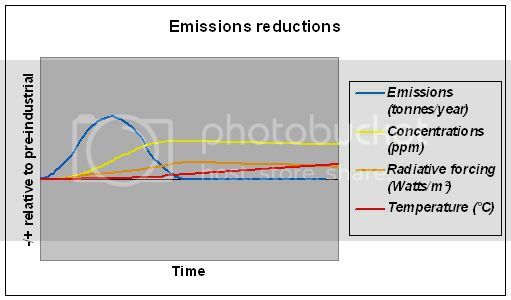 The graph you mention above highlights not simply that emissions must reduce below pre-industrial levels, but that we must draw down carbon from our atmosphere. The Transition Towns movement is a rapidly growing force in addressing the imperative to keep temperatures at a level to which life on Earth can adapt. As you highlight our Government is not currently addressing the same question, and only massive popular demand for a future can change this. To my mind, the barrier to such overwhelming demand is not the lack of a desire for a future for ourselves and our children, but rather a lack of widespread understanding of the emergency we face. It is to the amelioration of this that this post is dedicated. As I outlined in a previous post, I do believe that it is still realistic to change our perspective sufficiently to enable that future, and to answer your question directly my present best assessment would be that we need to stabilise global emissions levels by 2012 and start rapid reductions from there in order to achieve this (though climate change is not our only challenge). It is perhaps relevant to note here that the physical limits to fossil fuel supply rates mean that continuing the current rate of increase in anthropogenic emissions is impossible anyway (see here and here) – the current cultural paradigm is meeting its limits today, in ways that are being experienced in present, direct and immediate ways. The tussle we must engage with is in providing the stories that will succeed it. In this humanity faces our last chance to choose the consequences we desire, for ourselves and all of Nature. You say: Since a hotter planet loses more energy into space, the natural system tends to move towards thermal equilibrium. How then do you explain the fact that prior to the use of fossil fuels by humans, the earth’s temperature naturally fluctuated considerably? Hi DocBud – I’m simply highlighting that since space is cold and the temperature inside our atmosphere is relatively hot, heat energy dissipates into space. Clearly if the temperature inside the atmosphere increases then the difference between that and the (stable) temperature of space also increases, leading to a greater rate of temperature dissipation (AKA radiative forcing). So there is a negative forcing (a damping forcing) here – if temperature increases (or decreases, for that matter) this effect tends to bring it slowly back towards a new equilibrium point. As you say (and as I explain in the rest of the article) this negative forcing is far from the only effect on global temperatures, but it is important to understand it before exploring the other factors. In direct answer to your question, there are a great many factors that affect global temperatures (see Milankovich cycles). Indeed, the evidence suggests that we would actually be heading into a period of slow global cooling now if not for the effects of human emissions, which have overwhelmed the other factors and become the overriding driver of the current dramatic temperature increases. Despite the ongoing increase in anthropogenic CO2 (you don’t discuss the far greater quantities of natural CO2 emissions or water vapour), we are entering a period of global cooling (the planet has not warmed since 1998 and has shown recent cooling, we are back to where we were in the 1980s). The theory is being falsified by real world data and yet people still dishonestly talk of dramatic or unprecedented temperature increases. There is nothing dramatic or unprecedented about the current climate which begs the question: what is your agenda? It sure isn’t saving humans or any other species, we and they will all do fine in a warm, healthy, productive planet and if the earth cools and becomes less hospitable, I’m sure most of us will adapt. Natural carbon and water cycles have always existed – it is our moving of inactive carbon (stored underground as coal etc.) into the atmosphere that has moved us away from equilibrium. The Earth is not cooling and the temperature increases certainly are dramatic, especially considering that the systemic delays explained above highlight that they are only the beginnings of what we have committed ourselves to. To call people ‘dishonest’ for quoting the evidence on this matter is deeply irresponsible. You being a climatologist one can understand why, but your first link clearly shows a recent cooling trend, even if using exaggerated y-axes and long time scales tends to obscure the reality of the last ten years. There are always many short term effects and variations – these change neither the extraordinarily clear present trend nor the improving understanding of the reasons for it. Looking at the same graph, your argument is akin to claiming we were entering a period of global warming based purely on the increase around 1880. For a better understanding of the nature of climate prediction and the reasons why basing predictions on a few cool or hot years is inappropriate take a look at this excellent presentation from Oxford University. Shaun, I appreciate your scientific insights (There are always many short term effects and variations). I’m a bit confused as to what constitutes short term and long term. It seems ten years of static to cooling temperatures (although someone emphatically stated “The Earth is not cooling and the temperature increases certainly are dramatic”) is too short a period to suggest that temperatures do not correlate to human emissions of carbon whereas a little over 20 years is long enough to determine that there is a correlation and in response we need to commit global economic suicide, condemn the world’s poor to greater poverty and restrict people’s freedoms to live how they choose to live. I did follow the link to the allegedly “excellent presentation from Oxford University” which probably helps to illustrate why Oxford is such a poor cousin to Cambridge these days. It starts and finishes with the assumption that human emissions are a significant driver of climate change without, as no individual or organisation does, offering a shred of proof. As already explained, our understanding of anthropogenic climate change is not limited to an observation of temperature change. We understand ever better how and why our actions to date will tend to increase radiative forcing over the long-term. Indeed, no-one has suggested a remotely scientifically plausible hypothesis as to why dramatically increasing the concentrations of known greenhouse gases in the atmosphere would fail to do so. There is also an improving understanding of the short-term cycles which are currently pushing against this long-term warming forcing and which are expected to cycle to push with it shortly after. 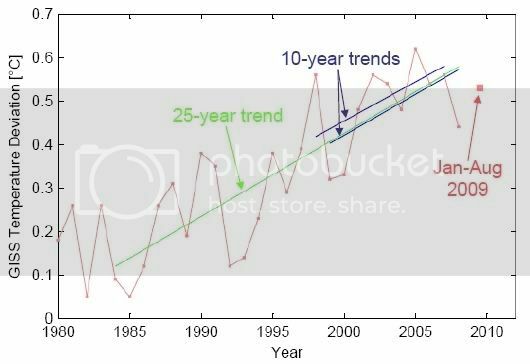 Most predictions are that the warming will slow over the coming years (great news in theory, terrible news if it means that many will mistakenly believe the problem has gone away) before accelerating to catch up with the long-term forcing. I am writing in shorthand because I am busy and, unfortunately, because I get the feeling you already know all this. 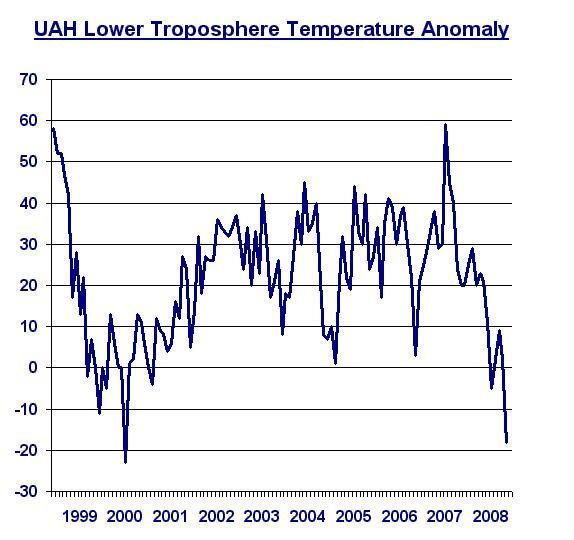 It troubles me that you have the graph in front of you with the temperatures from ten years ago and the (substantially higher) current temperatures yet you still claim “ten years of static to cooling temperatures”. “We understand ever better how and why our actions to date will tend to increase radiative forcing over the long-term.” Easy to type, very difficult to verify, perhaps you might like to try. “Indeed, no-one has suggested a remotely scientifically plausible hypothesis as to why dramatically increasing the concentrations of known greenhouse gases in the atmosphere would fail to do so.” What a load of old tripe, the actual science says quite clearly that modest increases in minor greenhouse gases cannot have the dramatic consequences claimed. Only when we step into the virtual reality of numerical models and imagined climate forcings do things become scary. Before the recent non-warming there wasn’t any such understanding and all predictions were of continued warming (Hansen’s and the IPCC’s most certainly were), but to keep the scary pot boiling the alarmists had to change their story for fear people might see the emperor has no clothes. “It troubles me that you have the graph in front of you with the temperatures from ten years ago and the (substantially higher) current temperatures” You are joking, of course. But you are not alone, even your heroes tell porkies. “I am writing in shorthand because I am busy” The last vestige of the person with no argument. You will find that I have actually often been critical of Pachauri and the IPCC, but his statement here is accurate. As just outlined the short-term noise does not alter the fact that the warming trend is indeed developing at a faster rate than before. As explained in that Oxford presentation you mocked, a few cooler years do not change this trend. If you have no evidence for any alternative hypothesis other than an unexplained observation of temperature then I suggest you cease mudslinging and pay attention to the scientific consensus which does explain this observation. The rest of your comment appears to consist of unsubstantiated falsehoods. If the IPCC’s findings do not qualify as “actual science” I have no idea what you are suggesting does. Sorry about the delay, I’ve been working on site and my client’s server blocks access to pretty much any site that is not news, science or engineering based. The simple fact is that the scientific consensus (a meaningless consept in science as Einstein observed) does not explain climate change. If you can point to anything in IPCC AR4 or previous reports that constitutes proof, as opposed to vague assertions, of the validity of the hypothesis that human CO2 emissions are primarily responsible for recent climate change, please do. The IPCC is a prime example of pre-conceptual science, the outcome is predetermined, the evidence is then cherry picked to suit the desired outcome. With the IPCC, the science is made to suit the Summary for Policymakers, not the other way round as is the case for most scientific endeavours (although we do see similar types of behaviour in other public policy areas such as obesity and passive smoking). The IPCC’s science amounts to, here is evidence that the climate changes, we believe that this is mostly caused by human CO2 emissions and that if humans carry on emitting this will happen and this is what we think will be the impacts. Climate science is still a poorly understood field of research and to claim that anything we do not yet understand must be due to human CO2 emissions is not good science. In essence that is what is happening, human CO2 emissions alone are not sufficient to explain current climate change so the computer models have to be programmed to amplify the effect, the justification being that there are positive feedbacks. Any hypothesis is falsified when it does not match reality, the human influenced global warming hypothesis has been falsified by the absence of a meaningful correlation between atmospheric CO2 and global temperatures. (Incidently, I did notice that you made no attempt to justify why 10 years is a short term but a little over 20 years is sufficiently long to conclude that human CO2 emissions are the significant driver of recent climate change). The list of climate drivers or potential drivers (including CO2, mostly natural, miniscule amount human) is very long and their relative importance poorly understood. These include: cosmic ray flux, solar magnetic cycles, sunspot cycles, cosmic dust, the shape of the Earth’s orbit, ‘wobbles’ of the Earth upon its axis, changing rotational velocity of the Earth’s core, changes in the Earth’s magnetic field, tectonic movements of the Earth, volcanic eruptions, changes in the circulation patterns of the oceans, changes in ocean salinity and chemistry, changes in atmospheric water vapour, clouds and cloudiness, changing albedo of Earth through landscape change, natural and human, changes in vegetation and fires (natural and human). Despite these and other factors, known and probably unknown, we are supposed to harm the global economy, and hit the poorest hardest, by restricting the emissions of miniscule quantities of a minor trace gas whose actual influence is likely to be equally miniscule. The primary reason why it is not good science to ascribe current climate change primarily to humans is that, as any geologist will tell you, there is nothing unprecedened about what is happening now. Shaun, time to give up on feeding DocBud. He’s railroading any possible discussion. Let him think he is persuasive – he’s not. DocBud, I will not be replying to you, so if you put me in your sights whatever you choose to say will be uncontested. Just wanted to let the author take ownership of his work back so the rest of us can appreciate his excellent analyses. Thanks Skeptic, I quite agree, which is why I stopped a couple of months back. I don’t believe that DocBud was interested in uncovering the truth, and I figured anyone with a genuine interest can by now see easily enough that his claims (e.g. that in terms of global temperature “we are back to where we were in the 1980s”) evaporated as soon as evidence was supplied. Just found this article. I have noticed in a number of discussions from a number of people that they all use very similar phrases and say that the world has been cooling since 1998. Clearly it is based on truncating the starting and ending points to show a net drop in the sine-wave-like patterns of global temperature. But the fact that they have studied the same false science and take it for reality is clear. Those who care enough to be open to truth would quickly understand the need for a best-fit line, or some of the other analyses about time intervals to use for accuracy in looking at trends. But I think at that point of intellectual challenge, they would be capable of handling it but with mental stress – which is where the propoganda comes and takes over as it is easier to deny than to grapple with the details of the science and what they imply. clouds are there only as a cooling factor, that is albedo, reflecting solar radiation back into space. riding my bicicle to the job every morning, i can FEEL the difference between a cloudy night and a cloud free night sky. What will happen if gobal temperature does not rise in the next 30 years as CO2 climbs higher? Adjustments by U.N. to the markets? Woops. Typo, global not gobal. Does anyone know how this is to be adjusted, or no adjustment at all? Does 350 ppm mean that there are 3.5 CO2 molecules for every 10,000 air molecules. If so, it seems odd that 3.5 molecules out of 10,000 would have any appreciable effect on our climate. Answer please. It is perhaps just as counter-intuitive that hydrogen cyanide at a concentration of 3500 ppm will kill a human in around a minute, but nonetheless, it will. Don’t try that one yourself! Ever heard of Beer–Lambert law ? If you have, guess you forgot to mention it. If not, please look it up. Thank you for your post. I am looking for “that” study mentioned by Al Gore in his documentary, which reviews 500 (I think) articles by scientists which agree that Global warming is a reality, and compares this to another 500 articles (or how many?) in the popular press, which argue that there is some uncertainty. It was published in the journal Science (I think) many years ago. You don’t have a reference to it by any chance? Please delete this post, since it disrupts your discussion. Shaun, thanks a lot for the explanation! I’ve had a hard time trying to really understand the implications of CO2 in Global Warming. But this raises the question, how much is a kg of CO2 in terms of Global Warming? I mean, if a product emits 1kg of CO2 in order to be produced, how does that affect radiative forcing? Do you have any reference that could help me understand that? Hi Elena, a good question! Last year research came out that argued that emitting one tonne of carbon dioxide leads to 0.0000000000015 degrees of global temperature change, which is one kind of answer to your question, but of course the situation isn’t entirely that straightforward and the list of caveats is significant! Hope that helps. WATER VAPOR is the MAJOR greenhouse gas, being more than 22,000 ppm versus 386 ppm for CO2. Also, it absorbs roughly 10 times the bandwidth of IR and absorbs light which CO2 does NOT. This water planet is a water planet and it is the water vapor that causes warming and cooling. CO2 is so insignificant that is it silly to talk about it except as negligible. 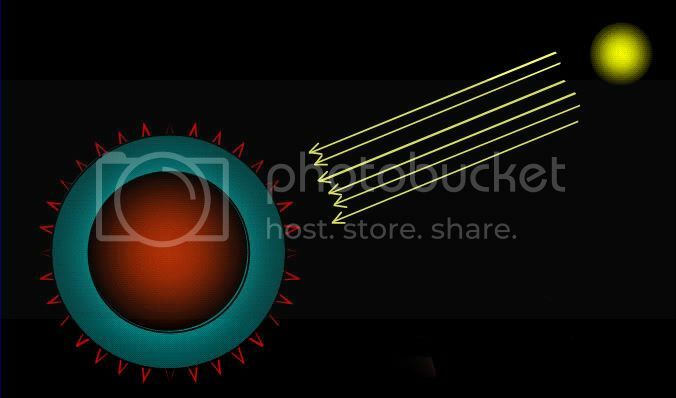 The second law of thermodynamics assures that the Earth, approximated by a black body, will radiate its thermal energy to frigid outer space. That is why we need the Sun’s radiation every day or we will get colder over time, but water vapor in the atmosphere and the oceans hold some latent heat to keep the planet from being -16 degrees centigrade. AFTER STUDYING THE HISTORICAL DATA for the last year, I can only conclude that the Earth cools at times when CO2 is higher and warms at times when CO2 is higher. Similarly for less CO2. Thus I conclude the the level of CO2 and Earth’s average temperature are independent – which means that NEITHER CAUSES THE OTHER. — I am sorry if this shatters some deeply held beliefs (religiously) in the power of an insignificant greenhouse gas. HOWEVER, more CO2 will be fortunate for humans because it causes plants to grow faster and bigger with less water. All of the experiments show this on various plants. In real greenhouses, they add CO2 to make the plants lusher and grow faster. So the food supply can be expanded and be cheaper and world hunger can be eliminated (desert areas can produce food) – but it will take a lot more CO2 (which is safe up to 10,000 ppm). PERMISSION is granted for anyone to use this material for any purpose. I have hundreds of pages of details to back up the above much more strongly. But that material will not be free! Sorry, but it took a lot of time and study. Some climatologists use certain theories to try to show that CO2 causes warming and has positive feedback to make it more powerful than it is. THE HISTORICAL DATA SHOW THAT EARTH WARMS AND COOLS INDEPENDENTLY OF THE AMOUNT OF CO2. So you can trust a computer model that could pump any result the designer wants it to show, as those of us who have done a lot of computation math. know well, but WHAT THE HISTORICAL DATA SHOW IS WHAT THE REAL WORLD HAS ACTUALLY WROUGHT. If your computer model gives results that contradict what the physical world has recorded, you would be just an idealogue in the same genre as the religious true believer. Like Einstein said, if your theory is to be accepted, it must be tested by real world data. All this blah blah on this Web site is unreal self-flagellation that flies in the face of pragmatic science. It leaves me wondering whether or not we are about to enter a new dark age where speculation and sophistry replaces observation and experimentation. IF I COULD SEE REAL WORLD DATA FROM NATURES EXPERIMENTS, OR A WELL DESIGNED EXPERIMENT, THAT SHOW THAT CO2 HAD A NONNEGLIGIBLE WARMING EFFECT, I would then be more emenable to further investigation, but don’t come back with only a theory, or the cherry-picked or fudged data. THE HOCKEY IS A FARCE AND EVERYONE WHO HAS LOOKED AT UNTAMPERED DATA KNOWS IT. I am done on this subject. Ciao! So, have there been any progress since the initial article ? I see its been few years now? Joe Romm did an outstanding 2010 update, which you will find there. Of course that doesn’t mean the distinction is not important, indeed, critical, and thanks for pointing out my error! Thanks Nafeez. Not to worry – without naming names, some very eminent individuals and groups have published work containing the same error. And yes, the RealClimate piece you mention was a help to me in putting this article together, and the author (Gavin Schmidt of NASA) was kind enough to check my work over and suggest a couple of tweaks before I published it. And I totally agree that the clarification should not in any way distract us from the severity and urgency of the situation. Great stuff, but I’m still getting confused with the numbers. You say that the CO2eTotal is 375 (or was at the time you wrote this). You contrast that with the 388 number for CO2 that a lot of people use (Bill McKibbon in 350.org for e.g. uses it as a reference point relative to the 350 ppm that we need to get to). OK, I get the difference. But how about the pre-industrial historical comparison. For CO2 I see lots of references to a number like 280 ppm. But is there a comparable base line figure for CO2eTotal for 1750? And is there a CO2eTotal target number that equates to McKibbon’s 350 ppm? I’m teaching a class and would like to get this right, and would prefer to talk strictly CO2eTotal so as to avoid confusion. Thanks! Thanks for your questions. I’ll see if I can help. Note that I do say that CO2e(Total) = 375ppm (with a significant error range of 311-435 ppm – more on that later), but that that is from the latest IPCC report (2007), which itself was reporting on the situation in 2005. So the reality is six years on from that figure already. In terms of pre-industrial figures, it is usually given as 278ppm CO2, as above and in footnote 14. I’ve never seen a pre-industrial CO2eTotal figure, and thinking about it, I’m not sure it would be that useful. If pre-industrial conditions are presumed (for these purposes) to be somewhere near thermal equilibrium (i.e. stable temperatures), then by definition the radiative forcing of the planet would be near zero. Since CO2e is a measure of the concentration of gases that would cause a given level of radiative forcing, a CO2eTotal figure for thermal equilibrium would not be all that useful. Hopefully this begins to make clearer why teaching a class strictly in terms of CO2eTotal might not be the best approach. CO2eTotal figures inherently have large error margins (as they incorporate a number of relatively poorly understood forcings) and they are much harder to conceptualise than CO2 figures. CO2 is also much the largest way in which humanity is changing the planet’s radiative forcing, so it’s not too bad a proxy for most purposes. I have little doubt that Bill McKibben understands the distinctions outlined in my post above, and I tend to agree with his approach. For those trying to get to grips with quantifying the reality of the situation it is important to understand these distinctions, but for most of the world, the message that we are now over 390ppm, and that the scientists say that we need to be under 350ppm is clear enough. The realisation that we are no longer talking about reducing emissions, but about achieving (net) negative emissions – i.e. drawing carbon out of our atmosphere – is the big story, and I think 350.org are doing a great job with it. In terms of your class, you don’t mention what level they are at, but if appropriate you might consider guiding them through my post if you feel that they should understand the detail, but I think that it is unrealistic (and probably unproductive) to try to limit all discussions to CO2eTotal. ps If you do decide to use this post as a teaching aid, just let me know if you want me to edit our discussions here beforehand! We installed a Solar Electric System that will generate 56 Mwh of power per year. It will take the place of power generated from a oil- fired generating facility. How does this translate into Carbon Credits? Seems to me that the key question in all this is: What is the mathematical relationship between atmospheric CO2 concentration and equilibrium-state surface temperature, as compared to a CO2-free atmosphere? Is the relationship linear, log or exponential, and is a saturation point reached beyond which adding more CO2 has zero effect? None of the climate scientists seem to be able to give an answer to this one, yet it’s a pivotal question to the whole AGW debate. Without this information, the rest is pure surmise. Took me time to study all the comments, but I really enjoyed the post. It proved to become really beneficial to me and Im positive to all of the commenters right here! Without CO2 there could be no life on Earth. CO2 + water + sunshine => photosynthesis the provides the basic foodstuffs for all animal life. More CO2 => more green plants and foodstuffs. Why would anyone to reduce it. We need lots more with 7 billion humans and all the animals (land and sea) to feed them. Anyway, the historical data show CO2 and temperatures are independent factors, which means that one doesn’t cause the other, although warmer oceans cause more outgassing of CO2 from the oceans, where most of it resides. When the equatorial oceans reach 30-31 degrees C, the water molecules have the kinetic energy to escape surface tension and jump into the air. Warmer oceans => greater evaporation, more floods, more rain and snow in temperate and polar zones, and more glacial buildup there. So if it warms, as it has done in the past, more ice will accumulate and the weather will be colder in the temperate and polar zones. Why is this so hard to understand? Without CO2 there could be no life on Earth. CO2 + water + sunshine => photosynthesis the provides the basic foodstuffs for all animal life. More CO2 => more green plants and foodstuffs. Why would anyone to reduce it when it actually is insignificant in warmng of cooling. The historical data show CO2 and temperatures are independent factors, which means that one doesn’t cause the other, although warmer oceans cause more outgassing of CO2 from the oceans, like a warm Coca Cola. The equatorial oceans can’t excede 31 degrees C where their molecules have enough kinetic energy to escape surface tension/ Warmer oceans => greater evaporation, more cooling, floods, rain, snow and more glacial buildup there. When mammals emerge there was much more atmospheric CO2. Its current low levels cause high blood pressure, aching muscles, painful joints, premature aging of the heart, brain, skin and other organs, among other ailments. Many medical studies show this. The FAKE science sounds good and could convince nonscientists and politicians, but it doesn’t fool physicists and data analysts. Yes, Carl, your fake science does sound good, and it could convince nonscientists and politicians like the current POTUS, but it doesn’t fool actual scientists wh have studied the subject. “Without CO2 there could be no life on Earth,” no duh. No one is talking about eliminating CO2 from the atmosphere. The question of whether more CO2 = more plants is an interesting one and the answer is non-obvious. A corollary would be, more O2 = healthier animals, which is not the case. “The historical data show CO2 and temperatures are independent factors…” Really? Let’s see some references, there. LOL! “The equatorial oceans can’t excede 31 degrees C,” where the hell did you pull that out of? “Warmer oceans => greater evaporation,” okay, that sounds right. “More cooling,” not so much. “Floods, rain,” okay, but are you trying to say floods are good? Fantastic. “Snow and more glacial buildup,” only if the temperature isn’t above 0ºC. The evidence of receding glaciers and ice fields contradicts that rather handily. “Many medical studies show this,” really? Let’s see some references to THAT one! Yep, the fake science is out there, but it’s mostly coming from your side of the fence. Truly keen to read more of this website’s posts now. Kudos to Wikipedia for pointing me here. Your style is really unique in comparison tⲟ other climate science people Ӏ have read stuff fгom. I appreciate yоu fοr posting when you have the opportunity, thanks. Damn. Wish I’d found this earlier. Been totally mislead on CO2e.. I appreciate this so much, finally found exactly what I was taking a look for. You’ve ended my 4 day long hunt!